Netbase is one of dozens of companies that measure social media. They out together a handy graphic to measure what they define as “brand passion” based out of social conversations. What’s interesting to see in the tech space is how not unexpectedly, Apple and Twitter dominate the passion zone and to a lesser extent, Google and Facebook. Obviously, there’s some inbuilt biases here as Twitter has an advantage as the conversational platform. 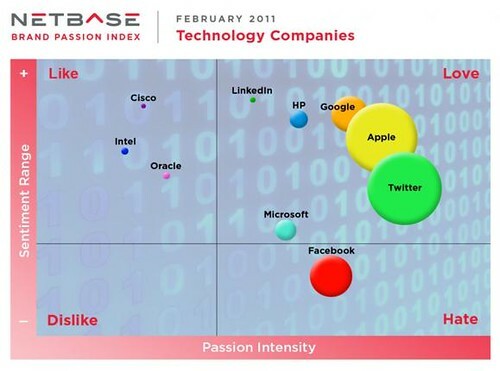 The other things to note is that while Microsoft and HP are in the passion zone, the intensity is pretty weak. For the brands who so want to play in this space; Intel and Cisco, they’ve got so much work to do. Overall, it’s a nice example of how to turn data into something that gets looked at and talked about. Should every brand have a non-tech incubator? Does the power of weak ties signal the death of marketing?